I can’t believe it’s been over three years since I finished my mosaic a day project and I’m finally ready to resurrect this blog. I’m not starting another project a day but I will be talking about creativity and how to bring more of it into your every day life. Look for more details right here in the coming weeks. Right now I’m excited to talk about a project I recently finished. 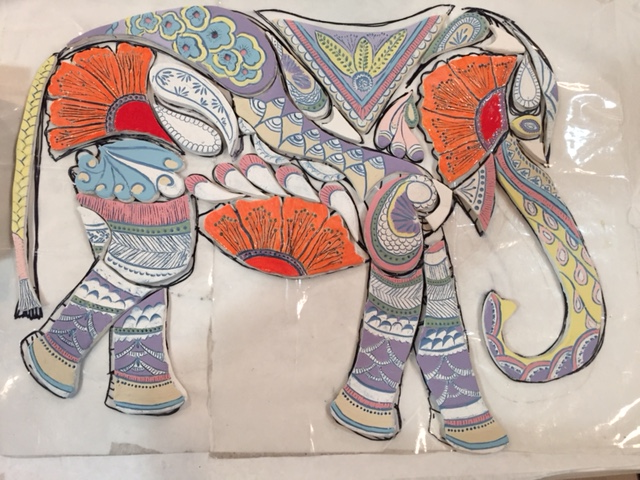 This is the story of Ellie the Painted Elephant. The fun started when I was browsing in a bookstore and happened to leaf through one of the many coloring books. Suddenly, with a jolt, the idea for a mosaic found me. It was just like Elizabeth Gilbert described in her book, Big Magic. An idea found me, I said yes and decided to “cooperate fully, humbly and joyfully”. I felt completely different when the idea grabbed me; it was like I came back to life. I don’t know where I had been but I definitely came back from somewhere that wasn’t quite as alive as I now felt. I immediately bought the book and went home to started planning and drawing. This happened on a Sunday and I wanted to be ready to start making the clay tiles in class on Tuesday evening. It felt amazing to be working on a project again! My life had meaning and focus again! 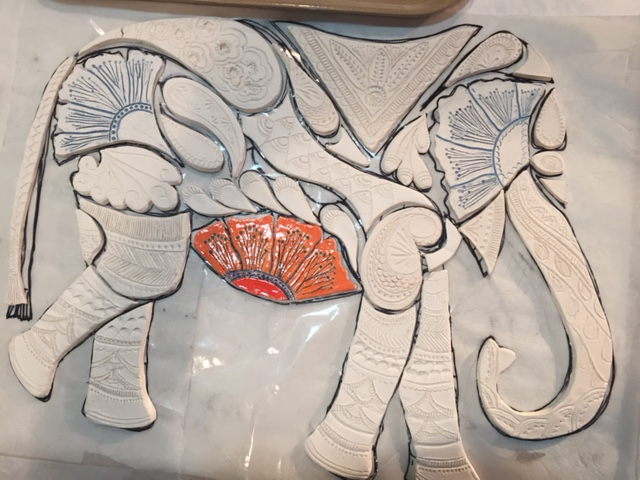 Each week I was so excited for Tuesday evening to come so I could continue to make the tiles. In between classes I made copies of the picture and colored them using various color schemes and I asked my friends to tell me which they liked the best. I created a ritual that I followed before I started each work session; I laid out my drawing on the table and put all the finished pieces down. It was like a kids puzzle – matching the shape to the tile. Then I admired what I had done, took a deep breath and felt that calm, happy, satisfied, proud feeling wash over me. I never felt frustrated and I never wanted to hurry to finish. I was experiencing such bliss with this project. I savored every moment. It took me a few months to make all the tiles and glaze them since I only got to work on the project about 2 hours a week. Finally, I had all the pieces completed. 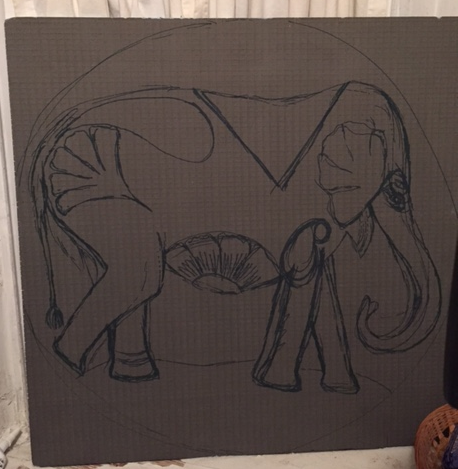 I took it all home and glued Ellie (that’s the elephant’s name) onto her board. Ah, she looked so pretty! I had been thinking about the background all along and I knew exactly what it looked like. I just had to find the glass tiles I was seeing in my mind. This part took me a couple months partly because it wasn’t easy to find exactly what I wanted and partly because life events interfered. I kept going, though, and finally the background was glued down. Grouting day finally arrived! 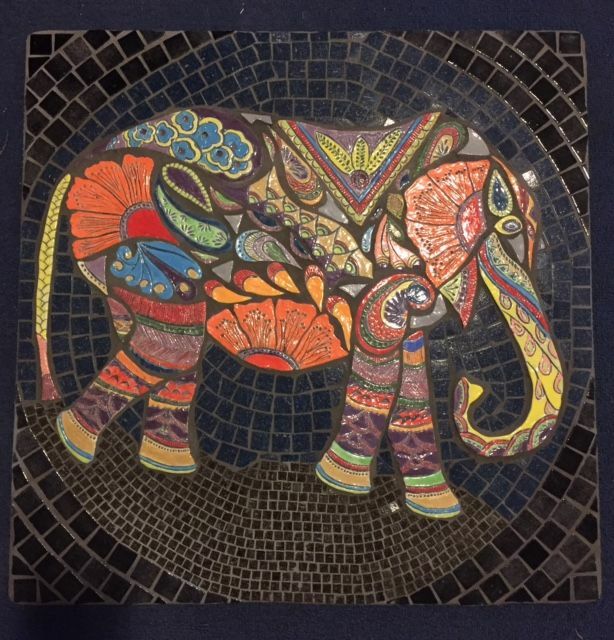 I took Ellie back to the mosaic studio to be grouted. It was important to me to share this final step with my mosaic friends and of course I wanted to show off the finished project. And then she was done. Ending projects is always a little difficult. I had focused on this project for almost a year and it all suddenly ended. An interesting thing happened then – all along I thought Ellie was going to hang in my den over the couch but I realized as soon as I finished making her that I didn’t need to keep her. I felt so close to the project but when the process was complete and I saw the finished product, I was done. It was a very satisfying experience and I’m proud of myself for completing it and I’m ready to keep going onto the next projects. I have several ideas for projects that came from this one and I’m excited to move on. I’ve been thinking about it the past few days and realized again that it really is the process that matters to me. I love the end product but I don’t feel attached to it. 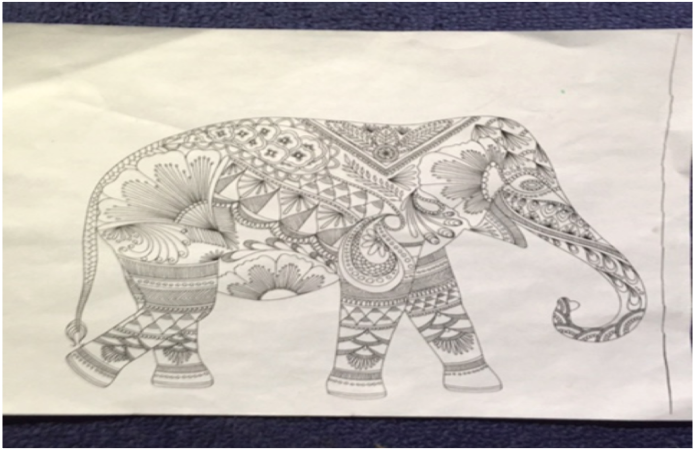 I would love for someone to have it that just sees this beautiful elephant and falls in love with her. That would make me happy. 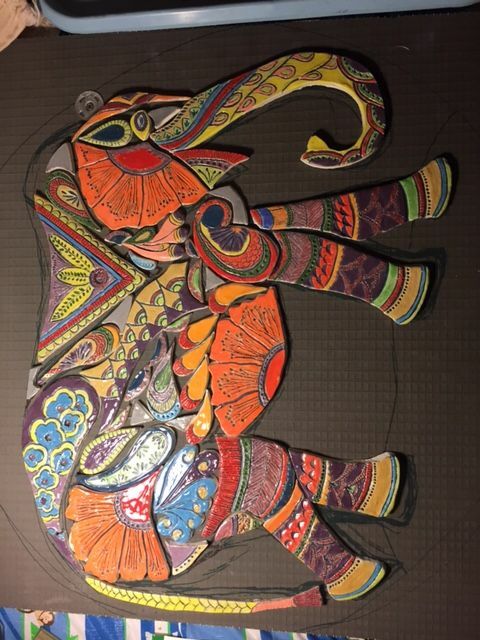 Please send me a comment if you have any interest in owning Ellie the Painted Elephant. She really is a joy to have around! She is just beautiful Judy! I love the color scheme. I miss you and mosaic class but life events are keeping me busy. I can’t wait to see what is coming next! Hi Sarah, I miss you too. We have a whole new group of people. I still love it. Are you having fun with your grandchildren? O Judy, she’s lovely! I’d love to buy her! Will you ship? Laura, it’s so nice to hear from you!. Yes, I’ll ship her. The total size is 23 1/2″ x 23″. Are you serious that you want to buy her?